SHEARER, JOHN (1845-1932) and DAVID (1850-1936), agricultural machinery manufacturers and inventors, were two of the five sons of Peter Shearer, stonemason and blacksmith, and his wife Mary, née Kirkness. John was born on 9 September 1845 and David on 7 November 1850 in the Orkney Islands, Scotland. The family migrated to South Australia in 1852, living in Port Adelaide, Robe and, later, Clare where the brothers were educated. After an apprenticeship with Hanlon & Co., blacksmiths, John started a blacksmith's business at Mount Torrens. There, on 15 July 1871, he married 15-year-old Mary Jane Watkins. Later he joined J. G. Ramsay & Co., agricultural implement-makers, Mount Barker, and in 1876 started a smithing business at Mannum on the River Murray, repairing paddle-steamers and farmers' implements and shoeing horses. At 14 David attended Joseph Cole's Stanley Grammar School for a year, paying his fees with wages saved from two years as a farm-hand. In 1865-67 he helped his brother William, a blacksmith at Leasingham, then spent two years as an improver at James Ramsay's Clare branch; later he worked for Adamson & Co., Auburn, at wagonbuilding. After eighteen months in John's business at Mount Torrens, he was with Strike & Short, wagonbuilders and blacksmiths, Rice Creek, a firm which he bought in 1874. In 1877 David joined John in partnership at Mannum. On 28 February 1883 in Adelaide David married Mary Elizabeth Williams. 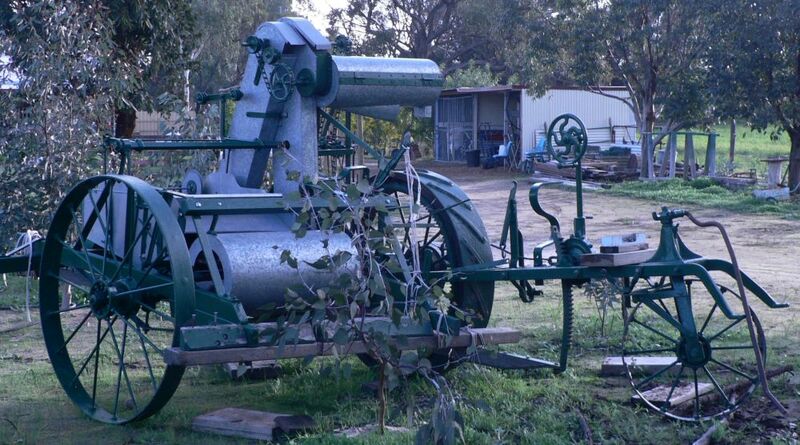 Farmland covered with mallee and native pine had to be cleared; farmers needed tough, durable equipment and supported the Shearers who made grubbing machines and fixed ploughs, scarifiers, harrows and strippers. In 1883 importers, other South Australian farm-implement manufacturers, and steamboat owners tried to prevent the Shearers from using up-river transport; the brothers were forced to subsidize the steamers to retain their fair share of river trade. This encouraged them to find markets further afield. In 1887 Shearers' advertised a 'Patent Fourfarrow Light Stump Jump Plough … Foremost in S.J.P. design since 1878'. In 1888 John invented wrought-steel ploughshares, which were patented throughout Australasia; these were an improvement on the brittle cast-iron shares in general use. In 1897 he visited the Meadows Steel Co. in England to consult them about the production of a resilient steel-this was known as Resilflex and 'became the backbone of all future Shearer implements'. By 1902 a lighter, stronger stripper, with a wider cut, and farm wagons were being manufactured. To escape the heavy transport costs from Mannum to Adelaide, the firm opened a branch at Kilkenny in 1904; John and his three sons ran it, the eldest son John Albert being manager. This factory started with twelve men who produced three ploughs a week. 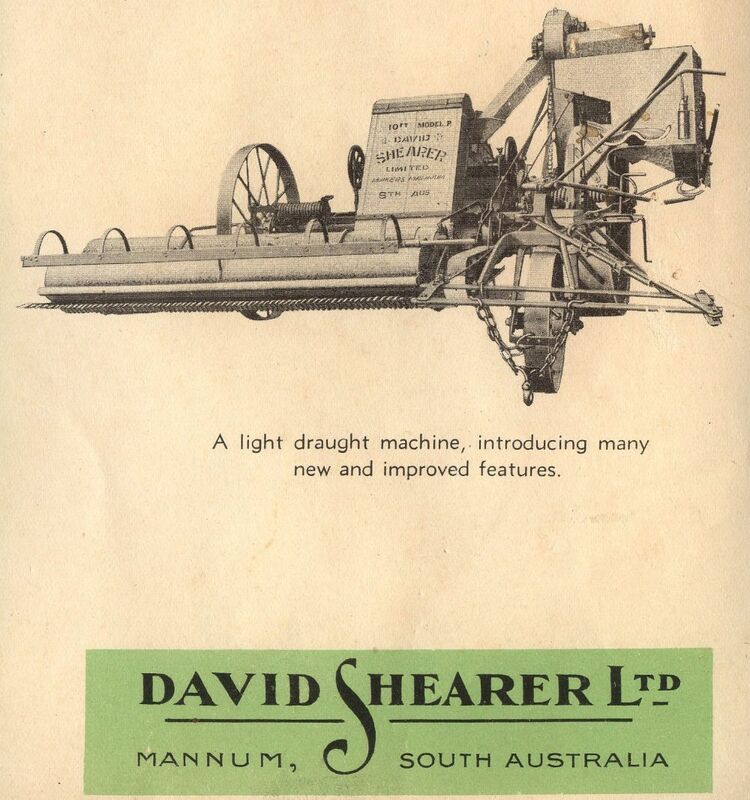 The Mannum partnership ended in 1910, David and his two sons remaining there and John retaining the Kilkenny branch, adding tillage implements to production of ploughs. In 1923 John, chairman of directors, and his sons (directors) converted their partnership into a limited company. John Shearer died on 9 August 1932 at his Kilkenny home, survived by his wife, four daughters and three sons. He was buried in Mitcham cemetery and his estate was sworn for probate at £15,980. A stocky, red-bearded, gruff man, he believed that 'soil is wealth, neither to be hoarded nor squandered. Land worked wisely is what we need', and he adhered to his motto, 'Work is life and idleness is death'. In 1952 the (John) Shearer organization became a public company which was taken over by Arrowcrest Group Pty Ltd in 1987. In 1904 the Mannum factory concentrated on strippers, wagons, harrows and ploughshares; 1910 saw the completion of another large factory. In World War I David Shearer & Co. made military equipment-munition wagons, stirrups and hames. By 1927 new additions, to accommodate assembling and painting, were added; the firm placed the Header Harvester on the market. With Harley Tarrant and Herbert Thomson, David Shearer made a major contribution to the independent development of the motor car in Australia. About 1882 he adapted the principle of the differential to a hand-tricycle. About 1885, as a hobby, he began to work on manufacture of a steam-carriage, basing transmission of power from engine to wheels on the stripper-harvester and steering on a principle used for the stump-jump plough. 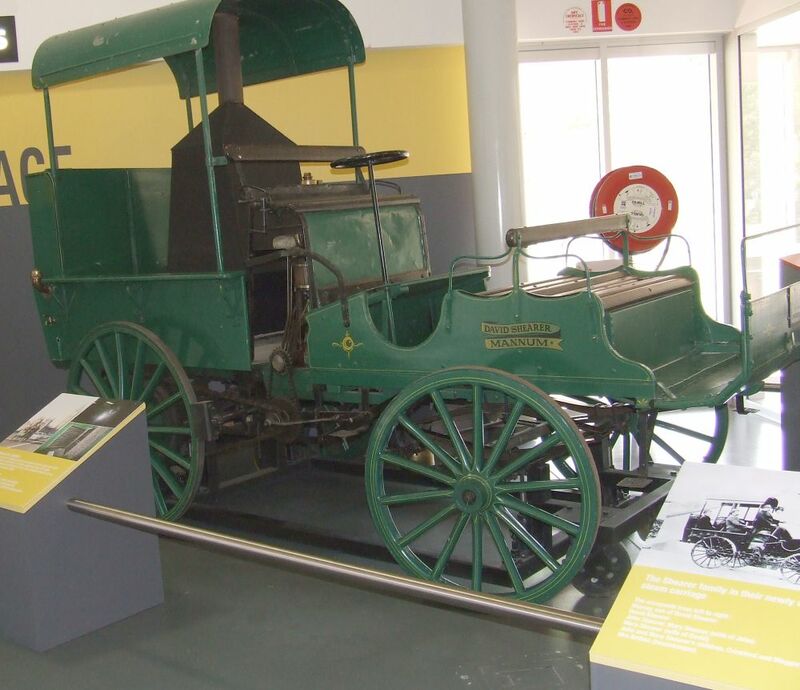 By 1897 he was driving his steam-car round Mannum where most of the mechanism had been manufactured; it would last for trips of 100 miles (161 km) and travel at 15 miles an hour. In 1900 he was allowed to drive it round Adelaide. The restored car is now at the Birdwood Mill Museum. Regarded as 'Mannum's Grand Old Man' David, thickset, with a mop of sandy hair, was a dreamer with a scientific mind. He joined the New South Wales branch of the British Astronomical Association in 1907 and built his own observatory and telescope. A student of phrenology, he also painted and drew. His religion was Unitarian. He died on 15 October 1936 and was buried in West Terrace cemetery. His estate was sworn for probate at £1858. In 1972 David Shearer Ltd (a limited company since 1922) was taken over by Horwood Bagshaw Ltd. John and David Shearer had sat on the Mannum District Council for many years, including periods as chairman. In the 1960s at Mannum the John Shearer Memorial Gates were erected and the David Shearer Sports Park opened. 'Shearer, David (1850 - 1936)', Australian Dictionary of Biography, Volume 11, Melbourne University Press, 1988, pp 586-587. Spanners marked Shearer are very hard to find - the only examples we have found to date ate a set of forged open enders produced for the war effort - with the D^D symbol and "SHEARER"
There are quite a few numbered ones that are listed in various implement catalogues. Shown below are some of the more interesting malleable iron ones that we could find reference to in Parts Lists. In 1972 David Shearer Ltd (a limited company since 1922) was taken over by Horwood Bagshaw Ltd. Please make contact if you have any further information or images to add. Shearer Forged DOE, about 9.5 in long. Shearer Malleable SOE # 199A, about 13in long. Shearer Malleable SOE # 3186, about 9in long. Shearer Cast Iron SOE # 3256, about 9in long. Shearer Malleable DOE # 3512, about 9in long. Shearer Malleable SOE # 3544, about 9in long. Shearer Malleable SOE # 3885, about 11in long. Shearer Steam Car built by David Shearer - seen at the National Motor Museum - Birdwood.